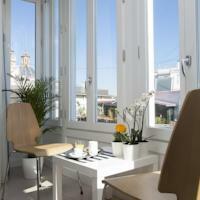 Holiday Accommodation in the Valencia City area of Spain. It offers 24-hour reception and a free Wi-Fi zone. Featuring tiled floors and light wood furniture, air-conditioned rooms have a TV and work desk. Rooms are also heated and have a private bathroom with a shower. Its central location means that the Pilar guest house is within a 5-minute walk of many shops, bars and restaurants. There is a tour desk and Valencia Cathedral is just 500 metres away. You can take a bus to the beach from the main square, which is within a 10-minute walk. Ding Dong Palacete is a renovated 19th-century building located 350 metres from Valencia Cathedral, featuring the original façade, iron balconies and stairs. Free Wi-Fi is available in the elegant air-conditioned rooms. Rooms feature high ceilings, stone walls and wooden floors. They have a flat-screen TV, safe and private bathroom with toiletries and a rain shower. Rooms are also heated and soundproofed and some have a balcony. Set in a quiet pedestrian street, the Ding Dong is within a short walk of Valencia’s busy main streets, full of shops, bars and restaurants. Valencia’s Main Square and Train Station are less than a 10-minute walk away. The Mosen Sorell apartments feature stylish décor. The kitchen includes a dishwasher, oven, microwave and coffee maker. 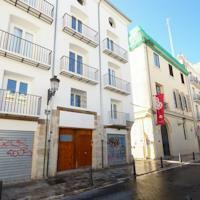 Some apartments also have a private balcony overlooking Mosen Sorell Square or a terrace. Valencia Cathedral and the lively Plaza de la Reina Square are around 650 metres from the apartments. 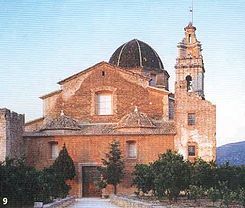 The former market of La Lonja de la Seda, a UNESCO World Heritage Site, is 450 metres away. The City of Arts and Sciences is 3 km away, and a regular bus service connects you with the rest of the city. All apartments at Mar 44 have a living-dining room with a sofa bed and a flat-screen TV. The kitchen includes an oven and ceramic hobs; while the bathroom comes with shower and hairdryer. There is a washing machine and ironing facilities are also provided. Some apartments have a private large terrace with outdoor furniture. There are plenty of bars and restaurants within a 3-minute walk of the apartments; and you can find fresh produce at the Central Market, 500 metres away. A 20-minute bus ride will take you to the City of Arts and Sciences, Oceanogràfic and Bioparc Valencia. Valencia Airport is 13 minutes’ drive away. The pictures at the top of this page are a selection of the different apartments. Please select a date and click on the apartments to see the pictures of the individual apartments. Valencia, Spain's third largest city, is located on the Mediterranean coast approximately 200 miles south of Barcelona. Although Valencia has a rich history, it is often referred to as one of Spain's more modern cities. Students will be captivated by de "City of Arts and Sciences" a masterpiece of modern-day construction featuring attractions such as the Planetarium, the Museum of Science, the Palace of the Arts and the Oceanographic Park. Most of Valencia Cathedral was built between the 13th century and the 15th century, and thus its style is mainly Gothic. Lonja de la Seda, is a late Valencian Gothic style civil building in Valencia built between 1482 and 1548, and one of the principal tourist attractions in the city. The Unesco considered it as a World Heritage Site in 1996. It is a secular building in late Gothic style, which dramatically illustrates the power and wealth of one of the great Mediterranean mercantile cities."